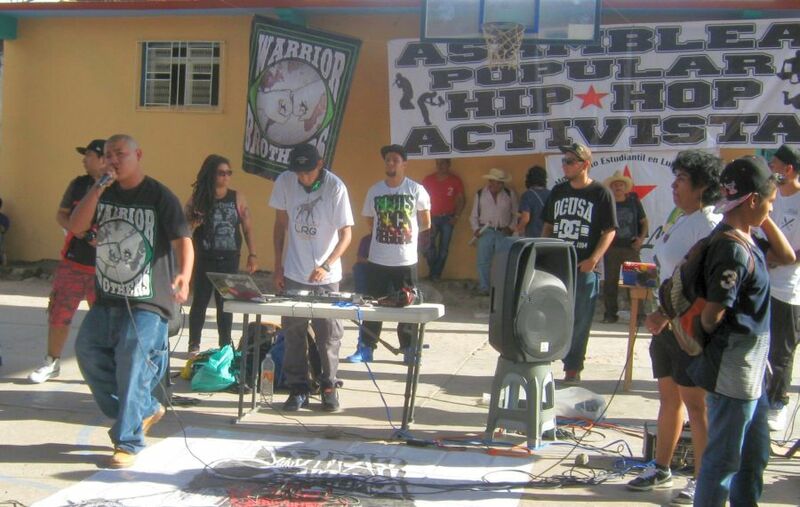 The People’s Assembly of Activist Hip Hop in solidarity with the struggle for justice in Ayotzinapa, Guerrero. The night of the 2015 spring equinox, two buses set out from Mexico City for the Ayotzinapa teacher training school. Aboard were MCs, DJs, Bboys, graffiti artists, muralists and silk screeners of the People’s Assembly of Activist Hip Hop. All were on the way to participate in an event organized with strong support of the organized teachers of Tixtla, Guerrero. Some had been in Ayotzinapa before, and others wanted to get to know the people in struggle there. Goyo: We want to show our solidarity with the teacher training students. We’ve come to express our rage and our anguish through creative activities – breaking, graffiti, silk screen and rap. That’s what motivates us to be here in the eye of the hurricane. Hip hop is a learning process, a building process. We don’t charge a single peso. We’re part of the people ourselves. Zucko: We’re here in solidarity with the struggle of the family members of the disappeared students. The only thing left for us young people to do is struggle, raise our voices, and support our comrades. Our activities are a means to freedom. Facto: We didn’t come here just to show off what we do, but to get to know our people, our community that is under attack by the State, an attack that’s been underway for a long time and that is now clear to everyone because of the disappearance of the 43 students, who we know are going to return. This cultural, musical event is also social and political. We’ve come to share what we do, who we are, and to form class ties and ties among a people. Macandal: Hip hop is a tool for transmitting knowledge, for joining people’s struggles together. Being here as young people says a lot: I’m young, like our 43 comrades, I’m criminalized, I’m marginalized. Coming here and seeing how you are carrying on the struggle, organizing, resisting and building, helps us learn more about how to build our networks. What does the People’s Assembly of Activist Hip Hop do? The Assembly brings different collectives and individuals together who want to work for something bigger. Have all of you been supporting Ayotzinapa during the last few months? Sure. With our music and also by going to marches, rallies, takeovers of buildings and highway toll booths, and whatever we’ve seen as necessary in Mexico City and other places in the country. In all the activities, we hear the parents of the 43 disappeared students ask something of the people: Don’t leave us to struggle alone. Does this have to do with why all of you are here this weekend? Of course. This is an important moment. It’s been six months since the attack and we see signs among the people that it’s in danger of falling into oblivion. We don’t want Ayotzinapa to be just another date, just one more October 2nd. We understand this call that the family members are sending out, and in this event maybe we can show that we’re not going to leave people to struggle alone who should never be left to struggle alone. This afternoon workshops will be held in the town of Atliaca. What is their purpose? In the workshops today, we want to talk to the people who come to the event, whether that’s the townspeople in general or, better still, the teacher training students themselves, so that everyone can say what we think and get to know each other as part of the hip hop culture, but also as part of the people that we all belong to, to build stronger ties. What are your expectations for the weekend? To get together with others who share our love for hip hop culture but who are also sensitive to the people and feel a responsibility for what is going on in their country, their land, their region. Once in a while we have to ask ourselves what kind of human beings we are who don’t feel the suffering, the grief, the rage of our brothers and sisters, and ask ourselves what we’re doing and who we are. On the way to Atliaca, some of the muralists stayed in Tixtla to begin to paint the walls of the City Hall, which was taken over by the teachers several months ago. Once there, Sentido and other graffiti artists started painting a mural that features an image of Lucio Cabañas at one side of the town square where the event was held. Meanwhile, Error en el Sistema (Nyjah and Natura) and Obeja Negra began to silk screen t-shirts. The breaking, rap and experiences workshops couldn’t have been more successful. The Twisted Flavors collective invited the people sitting around the edges of the plaza to come closer and form a circle. Then they showed approximately 25 people, including a little girl and a grandfather, some basic break dance steps. After the workshop, it was a joy to see the smiles on the faces of young kids who felt like they’d learned something important. A lot of people were also attracted to the rap workshop, where children, teen-agers and middle aged women learned how to put their thoughts and feelings into rhyme. The stew prepared by the teachers was delicious. We’re the reporter who always tells the truth. We’re General Zapata seeking land and liberation. We’re that insect devoured by a spider. We’re Genaro Vázquez, we’re Lucio Cabañas. We’re the cry of protest painted on a banner. We’re the voice that says: no forgiving, no forgetting. We’re the ones who struggle without pause and without hours. We’re the people bearing arms, we’re community defense. We’re the ones who say what we think and what we feel. We’re the one who says ever onward to victory. We’re the ideal that can’t be killed, can’t be slaughtered. We’re that pain and suffering, ¡we are Ayotzinapa! This is only one of the raps presented at Saturday’s concert in Tixtla, which began at 3 o’clock in the afternoon with Rima Roja, Nahua Tecuani, DJ Chola Loca, DJ Miki Maniak, Facto, Batallones Femeninos, DJ Contradicción, To cuic Libre, DM, Sentido, Zucko, Akep, Error en el Sistema, Nars, Magdiel, Adeek, Letras sin Censura, Dj Angeloop, Macandal and the Mexican Sound System. Two children climbed up on the stage to shout: “They took them away alive! We want them back alive!” An essay on the disappeared students of Ayotzinapa written by Mumia Abu-Jamal was read aloud, as was a letter to slain student Julio César Mondragón. At the end, in an mood of pure combative joy, all the MCs, DJs and dancers joined together onstage to close the event, together with two teachers who thanked everyone for the solidarity shown by Hip Hop Activista and urged everyone to keep struggling for the return of the 43 Ayotzinapa students – alive! Not everyone returned to DF after the event. A few comrades have been living in Ayotzinapa lately. When did you first come to Ayotzinapa? I first came to Ayotzinapa for a concert held last December 13 and 15 — A Light for Ayotzinapa. At that event there was police repression against the comrades that were setting up the sound system. They were attacked by around 200 federal police who were staying in the hotels of Chilpancingo around the place where the event was to be held. And from that moment on, I’ve been here. The situation is anything but agreeable. It’s a very painful time. It’s been five months, almost six, since the state disappeared the students, and as of now there’s been no response as to their whereabouts. I’m here because I believe that another world is possible, but we have to do the work to build it. I feel very happy to be here. Now I can say, yes, I’m from Ayotzinapa. I’m working in a silk screening project here on the ball court of the Ayotzinapa teacher training school. In Cd. Juárez I’d worked a lot with this tool of social transformation that can multiply a message. And Ayotzinapa seems to me the ideal place for continuing this work. Here I’ve gotten to know the parents of the disappeared students and some of the students and teachers. I ask them what message they’d like to see on a t-shirt, what image they’d like to see. With the help of some designers, we’ve printed their answers: “Where are our children?” “Ayotzinapa lives.” One of the collective designs is a tree bearing 43 faces, with the number 43 on the roots and the trunk. It says, “I won’t rest until I find you. The State is to blame.” The first one we did in collaboration with a friend from Radio Zapote (Hey, Poly), which has an image of a little turtle and the message: “I’m slow but sure. Yours truly, Justice.” The slogans motivate people to keep on struggling and give them encouragement and hope, in color. What do you think about the Activist Hip Hop event? It’s only natural for us to do this hip hop event this weekend in support of Ayotzinapa because the essence of hip hop culture is social denunciation and being one with the demands of the people because we’re part of the exploited, marginalized people. Even though hip hop has a lot of deficiencies like sexism, patriarchal values, seeing women as objects, it’s also really of the people, really of the street, really combative. It has that rough street aspect and that noble air of the countryside. It incites people to joy, but a joy that never forgets and never forgives. It fights, proposes and seeks justice. Is there a love for hip hop here at Ayotzinapa? I’ve had the opportunity to get to know the hip hop family here in Ayotzinapa. We understand each other, we talk to each other and communicate in codes. I’ve been able to communicate with some hip hop artists, some Bboys, one especially (Hey, House). I learned that there are BBoys and others with a love for this culture among the students who aren’t yet with us. Their parents don’t really like the music but they know that’s what their children listened to, and that brings us closer to the families and students at the school. How can there be more direct communication with the students and families here? To have more direct communication, you have to be here. For me, it’s been an enriching experience to talk to the comrades who were present during the attack last September 26, and it reinforces what I experienced in Cd. Juárez, where women have been disappeared for the last 25 years and where the guilty parties can’t be charged because they’re in power. What message do you have for other people? My message for other people is that we have to get organized. Some can’t come down here, but in our own barrios and neighborhoods we can look for people in contact with somebody here or in people with similar experiences. If we’re not willing to put up with repression and impunity from a State that places its bets on extermination, on oblivion, we have to do something. These are times where repression is intensified by that president – a killer who only knows how to repress, murder, torture and disappear people. We’re living an emergency where we have to organize and communicate in order to tackle it. We’re betting on art. Life against the imposition of death. Organization, struggle and resistance.